Give Mr. Ross credit: he hears the best in other rappers, and sometimes pilfers it for himself. He’s become an omnivore, his own repertory growing with his success, which isn’t always how things work. 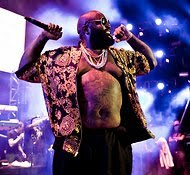 With clusters of meaty verses and throbbing, moody production, “Rich Forever” is almost on par with his last two solo albums, “Deeper Than Rap” and “Teflon Don” (Maybach Music/Slip-N-Slide/Def Jam), both great. In just a few years he’s become a real bear of a rapper. Powerful, indignant, protective: that’s how a bear feels, and that’s how Mr. Ross sounds, as if nothing could possibly derail him, and everyone who walks with him will be safe. What a great example of of diction control. Look back at the picture, then re-read the paragraph for food, eating, and animal references. This is why I read the Times.